As I mentioned in the post “When is a Mountain Not a Mountain,” the Blue Mountains are actually the remains of an ancient plateau that has simply been worn away until only a long, relatively narrow, and wildly carved strip remains. As a result, the usual approach to crossing mountains–look for a mountain pass–didn’t work. Explorers, adventurers, and escaped convicts had been trying since 1790 to find a way to the other side, but those who followed the area’s streams in hopes of finding a valley to lead them through the mountains invariably ended up facing a vertical stone wall. That is until 1813, when Gregory Blaxland, William Lawson, and William Charles Wentworth decided to give it a try. I had not written about these three previously, as one cannot include everyone, but a comment left on my previous post about the Blue Mountains reminded me that these three were worth noting, if for no other reason than so visitors to New South Wales understand why these names appear so often in areas near Sydney. Blaxland had hit upon the idea of climbing a series of ridges, rather than trying another foray up a dead-end valley. He invited Lawson and Wentworth to join him, and the three men set off in May 1813 from Blaxland’s farm, to try to learn what might lie on the other side of the mountains. It may not seem like it, but crossing the Blue Mountains was a very big deal for the colony. The narrow strip of flat land to the east of the mountains was already proving inadequate for supporting the growing colony of New South Wales. Crossing the Blue Mountains opened up the continent. It was the beginning of the colony becoming a new country. Blaxland, Wentworth, and Lawson all had interesting lives after this important accomplishment, though Blaxland did not end as well as the other two. However, before his decline, Blaxland had one other important impact on Australia. He imported grape vines, made wine, took 136 liters of his wine to London, and was awarded a silver medal. Five years later, a larger shipment of Blaxland’s wines earned a gold medal in London. Though grape vines had been brought to Australia by the first European settlers in 1788, Blaxland’s wine was the first wine to be produced for anything other than local consumption, and it is viewed as essentially the beginning of Australia’s international reputation as a wine producer. Lawson went on to be the first person to take cattle over the mountains in 1815, and he became a key figure in developing the colony. Wentworth became a lawyer and a poet, and worked tirelessly and effectively at obtaining a representative government for the young country. If you’re interested in knowing more, the Australian Dictionary of Biography offers more detailed information on each of the men and their accomplishments. In addition, you can read the exploration journals of all three men on the Internet. The fog didn’t keep us from exploring. Neither did the light rain that fell intermittently. Small towns with bookstores and tearooms helped when things were too wet to wander, but when it was simply damp and not actually raining, we continued on. Because it was gray and cloudy, there weren’t a lot of people, so we heard a lot more birds, including bell birds, which I loved. 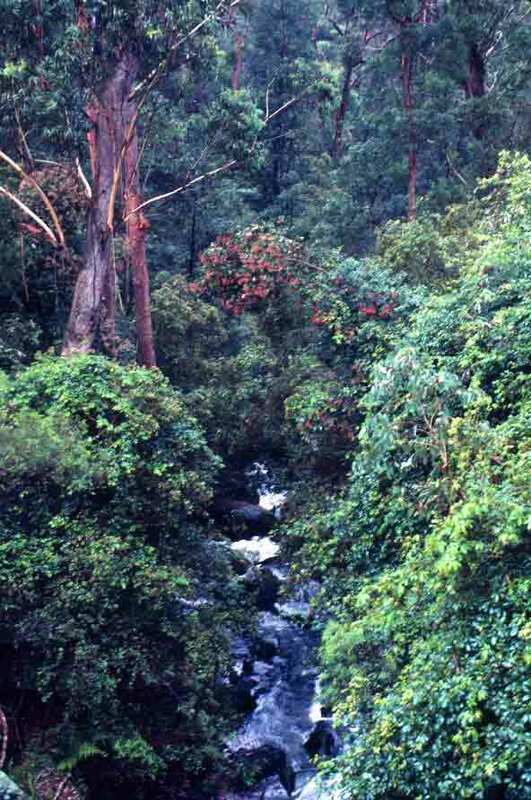 The dampness highlighted the beauty of the mountains and the lush foliage, as you can see in the photo below, left. Coming down the mountain, we stopped at an old, sandstone bridge. It is hard to identify things simply from photos, but searching for old bridges in the Blue Mountains, and comparing the photos online to the one I took (below, right), it seems that we had stopped to explore Lennox Bridge, the oldest bridge on the Australian mainland. (An older bridge exists in Tasmania — in Richmond — which I had seen earlier.) 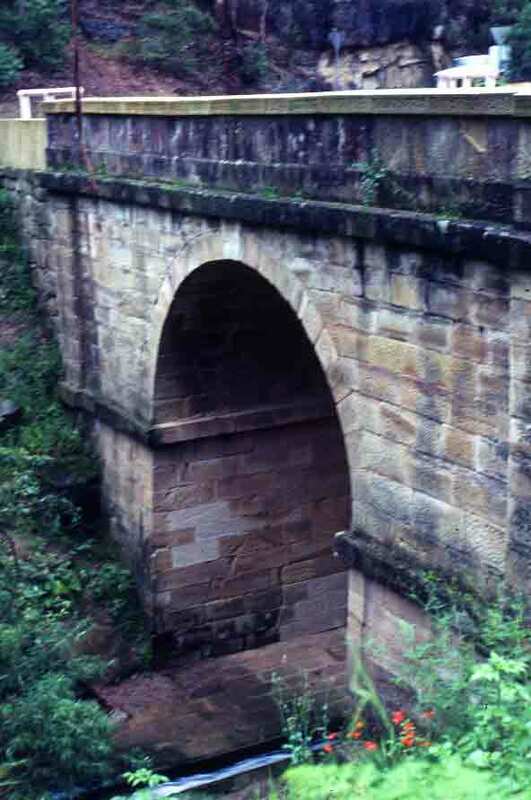 Built in the early 1800s of sandstone blocks, this bridge was for a long time the only way into Sydney for those traveling over the mountains. Today, it is still in use, though more modern bridges now serve busier highways. It has been designated a Heritage Site. But that first day, all I knew was that it was old and charming and looked oddly out of place, wedged between steep mountain walls.